Marijo Bos has more than 20 years of experience in talent management with fast growth global and entrepreneurial organizations. During her 11 years with a top executive recruiting firm (RRA) she co led the global media-entertainment practice interviewing 1000’s, matching and securing selected leaders for leadership roles in the Americas, Europe and Asia. She developed her skills on assessing and matching talent with the Walt Disney Company as this top client experienced exponential growth across businesses. She was later recruited to join a venture backed accelerator as SVP, Chief Talent Officer where her team attracted 300 media, technology leaders across 10 startups, from CEO’s to coders and created a internal community of collaboration. Previously Marijo served as President, Board Member of PWN, a Global Network supporting the business case for inclusive leadership. She collaborated with dozens of partner organizations across 24 city networks, 600+ events and numerous community mentoring programs. In parallel, she served as Partner, Oliver Wyman Executive Leadership and today leads Bos Advisors leadership and learning platform where she collaborates with clients and other global providers on the design and delivery of action learning and leadership programs for executives, teams and larger groups. 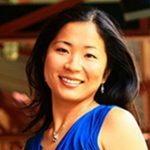 She facilitates growth and discovery dialogues with executive teams who then create environments where high performance team members are aligned on key drivers of success, on how to cultivates diverse and inclusive business practices thus creating a smart and highly connected team and organization. Positive leadership, resilience and the pause are embedded into programs on decision making, uncovering blind spots, compassion for self and others, advancing personal and business growth. Marijo has served organizations such as NTT, Merck, Disney, Bonnier Media, Anglo-American, Novartis, U.A.E Government, MAFT, Time Warner, Nike, AGCS, BT, Toshiba, WIMBIZ Nigeria, Morgan Stanley, UBS, Credit Suisse, Ferrovial, Cemex, Grupo Santander, Rolls Royce PLC, IE Business School WOB & Good Governance program, Duke CE and others. See full profile here. Bos Advisors collaborates with expert facilitators, coaches and business schools on program design and delivery, adapting themes to the context of a client’s organization, culture and stage of leadership development. Marijo also supports the growth of entrepreneurial companies as an Advisory Boards member of Multimedia Plus in addition to serving on the International Advisory Board of IE Business School. 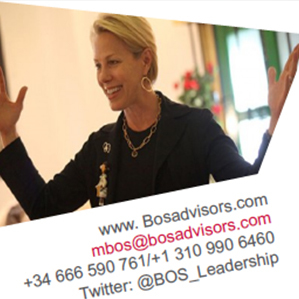 Marijo launched Bos Advisors based on her more than 20 years working in talent management from executive search, Leadership Learning and Development to leading a start up VC -Accelerator and building a global business networking community. She lives between Europe and the US, based in Madrid, Spain and Miami, Florida. Sundae Schneider-Bean facilitates intercultural communications around the world. She delivers leadership training at every level of the organization, with a special passion for top-talent and management. Her experience ranges from European multi-national organizations to international NGOs active in Sub-Saharan Africa. A sample of her industry experience includes software manufacturing, global pharmaceuticals, financial services, logistics, manufacturing, gas and engineering, higher education and auditing. She holds an MA in Communication, with a specialization in intercultural communication, has completed a fellowship program with the Swiss Postgraduate Program in Social Anthropology and is a multi-certified coach. Sundae has lived in the USA, Switzerland, Burkina Faso and South Africa. She collaborates with Bos Advisors and runs a company out of Switzerland, while residing in Pretoria, South Africa. Namika Sagara, Ph.D. is a behavioral scientist with 15 years of experience in behavioral science and decision making research. A collaborative partner with Bos Advisors, she conducts rigorous academic research and helps her clients understand and guide irrational human behaviors by providing training and research consultation, often as part of broader leadership and learning programs. Born in Japan, Namika grew up there and in Malaysia before moving to the U.S. to complete her B.S. and M.S. in Psychology, and Ph.D. in decision making research at University of Oregon. She was a Post Doctoral Associate at Fuqua School of Business, Duke University, and currently holds a visiting position at Duke University and is a president of Sagara Consulting LLC. Patrick Boland is a leadership consultant and coach. 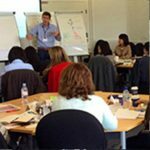 Patrick provides executive and leadership coaching, team coaching and psychometric assessments for leaders at every level of the organisation. His particular expertise lies in the areas of Millennial (Generation Y) leadership development and coaching, cross-cultural and senior team dynamics. 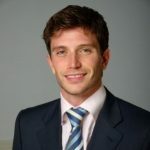 Patrick has worked with global organisations such as Deloitte, Google, Accenture and Microsoft. He holds a BComm International, three post-graduate diplomas, including Executive and Leadership Coaching, and an MSc in Guidance and Counselling. He runs a consultancy called Conexus and is based in Dublin, Ireland. Rachel Dreyfus is an Accenture-trained market research advisor solving strategic challenges through consumer insights. She has led market research initiatives at Fortune 100 and strategic consulting firms. Her expert focus is engaging executives in their customers’ unmet needs to identify marketplace “white space” or growth opportunities. Approaches include Customer Journey Mapping, Ideal Design, and application of behavioral economics. Recent clients include Fortune 100 brands and mid-size companies across service intensive industries experiencing digital disruption. This includes Telecommunications, Media & Entertainment, a Global Hotels & Resorts conglomerate and Mall Property Owner and more. 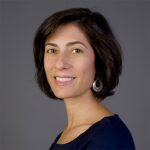 Previously, as VP of Marketing Intelligence for Time Warner Cable in New York City from 2005-2013 Rachel built and led a centralized research capability and broadened the scope of research to support Engineering, Product Management and Customer Experience. Her research led to groundbreaking innovations in products and customer experiences, navigating competitive threats and brand-building. Her team delivered insights contributing to more than 200% growth in Broadband subscribers and 400% growth in home phone subscribers. Rachel is an award-winning member of Cable Television Association of Marketers (CTAM) and an active member of the Customer Experience Professionals Association (CXPA) and American Marketing Association (AMA). She is a guest-blogger for marketing and market research industry groups such as CTAM, Greenbook, Hispanic TV Summit and International Institute of Research and her comments have been cited on Harvard Business Review (HBR.com). She is a graduate of Emory University and collaborates on bringing customer insights behavior to leadership development with Bos Advisors. 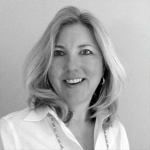 Kathy Turansky Ranek has an excellent track record working in executive search and talent management. Skilled in Operations Management, Executive Search, Organizational Assessment Management, and Account Management. BA f in Economics and History from University of California, Los Angeles.